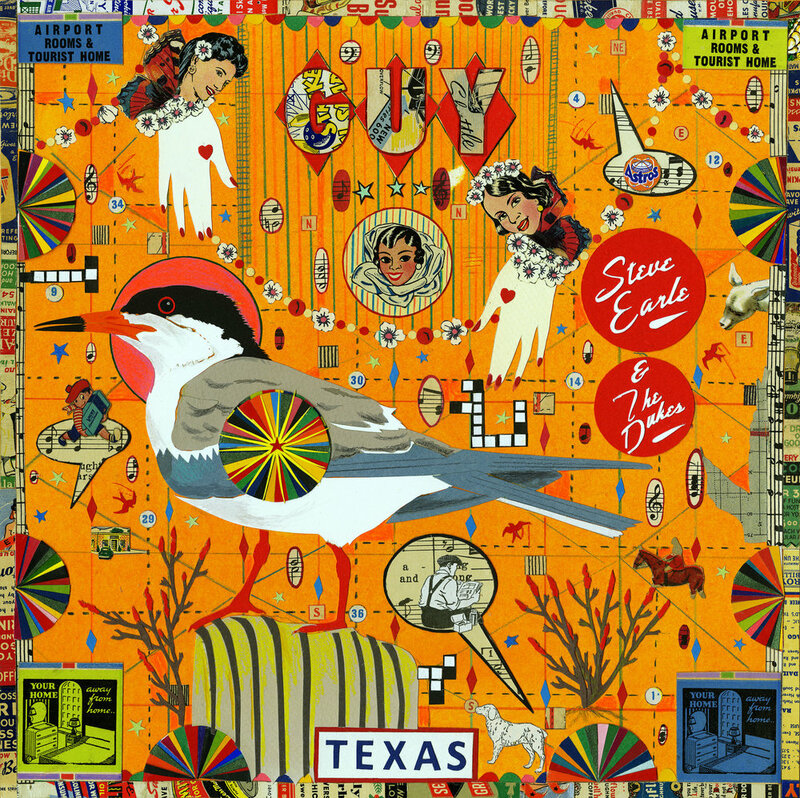 Steve Earle & The Dukes new album GUY is now streaming in full. Check it out in this week’s edition of the New Yorker. Steve Earle & The Dukes are set to return with GUY on March 29th, 2019. A return to New West Records, the 16-song set is comprised of songs written by one of his two primary songwriting mentors, the legendary Guy Clark. GUY appears ten years after his Grammy Award winning album TOWNES, his tribute to his other songwriting mentor, Townes Van Zandt. Produced by Earle and recorded by his longtime production partner Ray Kennedy, GUY features his latest, and possibly best, incarnation of his backing band The Dukes including Kelley Looney on bass, Chris Masterson on guitar, Eleanor Whitmore on fiddle & mandolin, Ricky Ray Jackson on pedal steel guitar, and Brad Pemberton on drums & percussion. GUY also features guest appearances by fellow Guy Clark cohorts Emmylou Harris, Rodney Crowell, Terry Allen, Jerry Jeff Walker, Mickey Raphael, Shawn Camp, Verlon Thompson, Gary Nicholson, and the photographer Jim McGuire. Today, NPR Music has premiered the album’s first single and lead off track “Dublin Blues” along with a nearly 30-minute conversation between Earle and NPR’s Bob Boilen for an edition of All Songs Considered. Hear it HERE. GUY will be available on compact disc, across digital retailers, standard black vinyl, limited edition blue vinyl available at Independent Retailers, an extremely limited-to-200 clear vinyl edition available at retailers in Texas & Tennessee, a limited autographed edition available at Barnes & Noble stores, and limited edition red vinyl exclusively available for pre-order now via NEW WEST RECORDS. Steve Earle is one of the most acclaimed singer-songwriters of his generation. A protege of legendary songwriters Townes Van Zandt and Guy Clark, he quickly became a master storyteller in his own right, with his songs being recorded by Johnny Cash, Willie Nelson, Waylon Jennings, Joan Baez, Emmylou Harris, The Pretenders, and countless others. 1986 saw the release of his debut record, Guitar Town, which shot to number one on the country charts. What followed was a varied array of releases including the Grammy Award Winning albums The Revolution Starts...Now (2004), Washington Square Serenade (2007), andTOWNES (2009). A true Renaissance man, Earle has become a novelist, a film, TV, and stage actor, playwright, record producer, and radio host. Earlier this year, he appeared in the off-Broadway play Samara, for which he also wrote the score that The New York Times called “exquisitely subliminal.” 2018 marked the 30th Anniversary of his legendary album Copperhead Road. GUY is Steve Earle’s 19th studio album. Steve Earle returns to The Town Hall in NYC for the 4th annual John Henry's Friends Benefit Concert, presented by City Winery, celebrating the Keswell School's work in providing education for children and young adults with autism. Long time Dukes crew member and Brother on the Road. Steve Earle is honored to join Emmylou Harris, Jackson Browne, Mary Chapin Carpenter, Shawn Colvin, Lila Downs, and Graham Nash on the Lantern Tour this fall to stand with families seeking safety at our border. Proceeds go to the Women's Refugee Commission. Tickets on sale for D.C., Collingswood, and Boston. Check out Music Master Camp's video with Steve Earle regarding Camp Copperhead. For registration and additional info, go to www.campcopperhead.com . Join Steve Earle and Special Guests at his Annual Songwriting Camp June 25-28, 2018 at Full Moon Resort in Upstate New York. Tickets include all workshops, private performances, open mics, lodging and meals. Space is limited so register soon to secure your spot at Camp Copperhead!